The Audi Q3 is a five-door compact executive/entry-level luxury crossover by Audi. The Q3 has a transverse-mounted front engine, and entered production in 2011. Designed by Julian Hoenig in 2006, it was a concept vehicle with Liquid Silver body colour, 20-inch wheels, fabric folding roof, electrically-controlled hood, 4-cylinder 2.0 TDI engine rated 204 PS(150 kW; 201 hp) and 400 Nm (295.02 lbft), diesel particulate filter and Bluetec emission control system, quattro permanent four-wheel drive system with Haldex clutch, Audi S tronic dual-clutch gearbox, McPherson-strut front axle and a four-link rear axle, Audi drive select system with 3 modes (dynamic, sport, efficiency), MMI control panel with touch pad and dual-view technology, sound system with the prominent extending tweeters. The vehicle was unveiled at the Shanghai Motor Show in April, 2007. The car uses the Volkswagen Group A5 (PQ35) platform of the Volkswagen Golf Mk5, the same as the Volkswagen Tiguan/SEAT Tribu small SUVs. 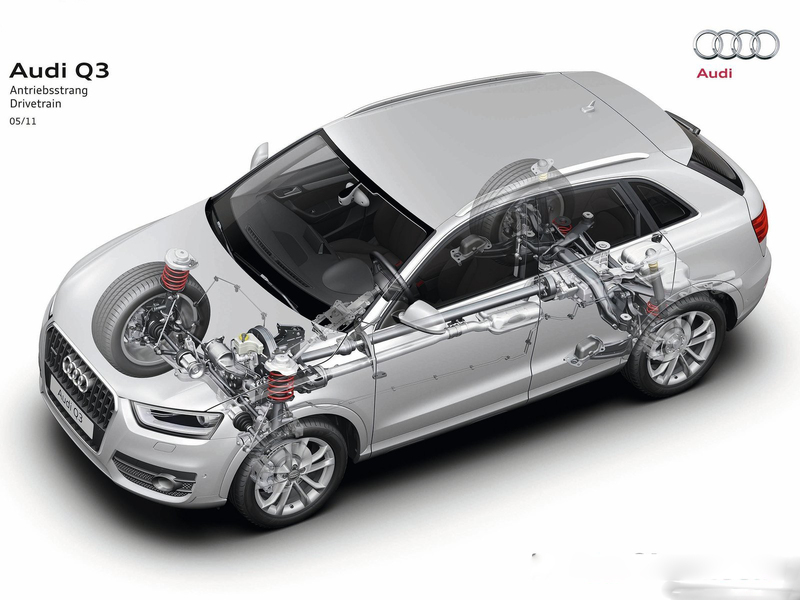 The Q3 slots above the proposed Audi Q2 mini-crossover. 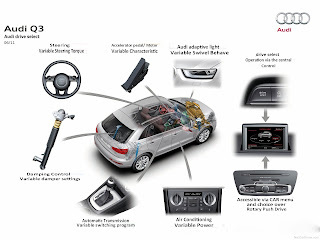 Compared to the mid-luxury compact Q5 and full-size Q7, which are positioned more for family practicality and off-road performance, the Q3 is aimed as more of a lifestyle/sports automobile. Design and development began following board approval in the second half of 2007. Julian Hoenig's design was chosen for production and frozen in 2009. The Q3 shares components, transmissions and engines with amongst other vehicles utilising the PQ35 platform, the Volkswagen Golf, Audi A3 and Škoda Yeti. The vehicle was unveiled in Auto Shanghai 2011. The vehicles went on sale in June 2011. Early models include 2.0 TFSI quattro (170/211PS), 2.0 TDI (140PS), 2.0 TDI quattro (177PS). Indian models went on sale in 2012. Early models include 2.0 TDI quattro (177PS). China models went on sale at the end of July 2012 as an import vehicle. The Changchun-made Audi Q3 entered market in April 2013, which included 35 TFSI (170PS), 35 TFSI quattro (170PS), 40 TFSI quattro (200PS), with 7-speed S Tronic transmissions. 2.0 TDI quattro with 103 kW (140 hp) was introduced in 2012 for Germany market as part of 2012 Paris Motor Show premiere. 2.0 TDI quattro (140PS) was introduced in 2012 for the UK market. It is a concept vehicle based on Audi Q3 with 2.5 TFSI (2,480 cc (2.48 L; 151 cu in) I5 turbo) engine rated 314 PS (231 kW; 310 hp) and 400 Nm(295.02 lbft), 7-speed S tronic transmission, Energy Red body colour, add-on body parts are in matt gray quartz-based paint, flared wheel arches and running boards, five-arm 8.5Jx20 wheels in matt quartz, 255/45 off-road tires, 40mm wider front and rear track widths and 30mm higher body ride height over production model. The vehicle was unveiled in 2012 North American International Auto Show. It is a version of Audi Q3 with blue body colour, 2.5 TFSI (2,480 cc (2.48 L; 151 cu in) I5 turbo) engine rated 360 PS (265 kW; 355 hp), 25 mm (0.98 in) lowered body, brushed and polished aluminum trim frames, single-frame radiator grille, Dark blue Alcantara on contrasting element on the seat covers, black CFRP door mirror housings, while matt aluminum trim at side windows, Ordos Blue body color, blue clearcoat and black CFRP at diffuser insert, clear glass rear lights and auxiliary lights in the bumper tinted in anthracite, black Fine Nappa leather interior upholstery on roofliner, floor carpet, floor mats, leather-upholstered instrument panel and on large areas of the seat upholstery; steering wheel upholstered in black Velvet leather, door trim panels in blue Alcantara, Chinese characters numerals in tachometer, 7-speed S tronic transmission, quattro permanent all-wheel drive, 8.5 J x 20 wheels with 255/30 tires. The vehicle was unveiled in Auto China 2012 in Beijing., and later in 2012 Wörthersee Tour. 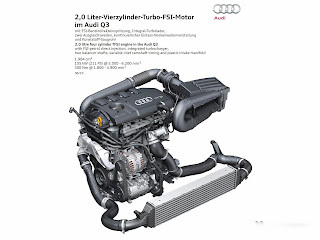 Q3 jinlong yufeng (金龍馭風) is a version of Audi Q3 with 2.5 TFSI (2,480 cc (2.48 L; 151 cu in) I5 turbo) engine rated 310 PS (228 kW; 306 hp), 7-speed S tronic transmission, two kiteboards made of carbon fiber-reinforced polymer, Liuli Yellow body colour, body add-on parts in matt quartz, Vertical aluminum struts in the single-frame radiator grille, xenon plus headlights in anthracite, aluminum panels cover the upper sections of the air intakes, aluminum underbody guard, flared wheel arches, brushed stainless steel running boards, roofliner in titanium gray Alcantara, black interior surfaces, instrument panel upholstered in black Fine Nappa leather and decorated with yellow contrasting seams, fine aluminum accents at instrument cluster, leather-trimmed steering wheel with contrasting yellow seams and two large shift paddles, foot rests and pedal made of stainless steel with rubber caps, seats upholstered in woven leather (narrow strips of leather interwoven with yarn, yellow piping and contrasting seams), side panels of the seat cushions and seatbacks in yellow Velvet leather, Velvet leather in parts of the door trim panels, stainless steel mesh decorative inlays, five-arm 8.5Jx20 wheels in matt quartz, 255/45 off-road tires, 40mm wider front and rear track widths and 30mm higher body ride height over production model. The vehicle was unveiled in Auto China 2012 in Beijing, and later in 2012 Wörthersee Tour. 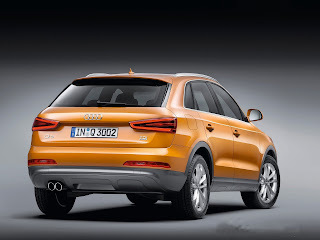 It is a version of Audi Q3 with 2.5 TFSI (2,480 cc (2.48 L; 151 cu in) I5 turbo) engine rated 340 PS (250 kW; 335 hp) and 450 Nm (331.90 lbft), 7-speed S tronic transmission, Energy Red body colour, five-arm 8.5Jx20 wheels in matt quartz, 255/45 off-road tires, 40mm wider front and rear track widths and 30mm higher body ride height over production model, headlining in titanium gray Alcantara, black interior, floor mats in black with narrow strips of red Velvet leather. The vehicle was unveiled in 2012 Wörthersee Tour. It is the first production RS model in a Q-series vehicle; based on the Audi RS Q3 concept. It features a 2.5 TFSI (2.5 L; 151 cu in) I5 turbo engine rated 310 PS(228 kW; 306 hp) @5200-6700rpm and 420 Nm (309.78 lbft)@1500-5200rpm, 7-speed S-tronic transmission with D and S modes, battery located in the luggage compartment, 4-link independent rear wheel suspensions, electro-mechanical rack and pinion steering, electro-mechanical parking brake and hill hold assist, 365 mm (14.37 in) ventilated and perforated front brake discs with wave-shaped outer contours, black eight-piston calipers with RS logos, electronic stabilization control (ESC) with sport mode, 19-inch alloy wheels in German market (optional 20-inch wheels, with exclusive 5 dual-spoke V design from Audi RS Q3 concept), body accents and roof rails in matt aluminum, special door sill plates and door trim strips, a high-gloss black honeycomb front grille, RS front bumper and quattro emblem in the front air intake, roof spoiler, rear bumper with diffuser insert, elliptical tailpipe, a rear RS Q3 logo, choice of 8 body colors (including the exclusive Sepang Blue pearl effect), instrument cluster with gray gauges and white scales and red pointers, contrasting stitching in rock gray trim at flat bottom three-spoke multifunction steering wheel and gear selector lever, MMI and driver information system with RS logo, RS menu with boost pressure, oil temperature and a lap timer; pedals and foot support in aluminum look, inlays in piano finish black (optional aluminum race or carbon), black (optional lunar silver) headlining, sport seats with embossed RS Q3 logos upholstered in black Alcantara/leather (optional Fine Nappa leather in black or lunar silver with contrasting stitching in rock gray or the design package with diamond stitching), reversible loadliner, optional towing bracket, RS-specific driver information system (park assist plus), Audi sound system with ten loudspeakers, xenon plus headlights, LED tail lights. The car accelerates from 0 to 100 km/h in 5.5 seconds and onto a top speed of 250 km/h (155.34 mph). Optional styling packages (in matt aluminum or black) include flaps in the side air intakes, the trim on the diffuser, and the fins on the roof spoiler. The vehicle was unveiled in 2013 Geneva Motor Show, followed by Wörthersee Tour 2013. Deliveries of German model began in fall 2013. Deliveries in the U.K. will start in early 2014. 150 PS (110 kW; 148 hp), ? 136 PS (100 kW; 134 hp) @?, ? @? 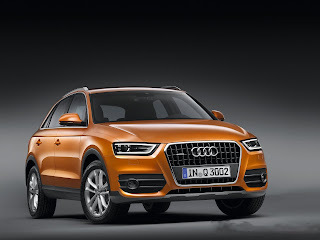 On 2011-06-07, Audi announced the production of Audi Q3 began at SEAT factory in Martorell, located in Spain’s Catalonia region, with annual production of approximately 100,000 Q3 units. In 1998, the production facility was chosen as the "Best Factory of the VW Group in the first quarter". Production at Martorell began on 2011-07-13 with Spanish Prince Felipe's inauguration at Martorell plant. The Audi Q3 is built in a FAW-Volkswagen plant in Changchun, China in a joint venture with its partner FAW; production began in 2013. The Changchun-made Audi Q3 first entered the market in April 2013. As part of Audi A3 launch in China, Audi Q3 Trans China Tour 2011 began in 2011-10-15, featuring roughly 160 participants driving Audi Q3 2.0 TFSI quattro S tronic (211PS) in a 16-stage 5,700 kilometers (3,542 miles) route starting from Beijing to Shanghai, Shenzhen, Guilin, and ending in Hong Kong. The tour ended with 20 cars arriving at the final destination in Shenzhen near Hong Kong. As part of Audi A3 launch in Taiwan, more than 11 famous independent bands were invited to present Q3 Urban Music Festival. As part of RS Q3 Cabriolet launch, Audi Land of quattro Alpen Tour 2013 featured RS Q3 begins on September 23, travelling across twelve driving stages in 6 countries (Klagenfurt – the capital of Carinthia, Austria, Monaco). 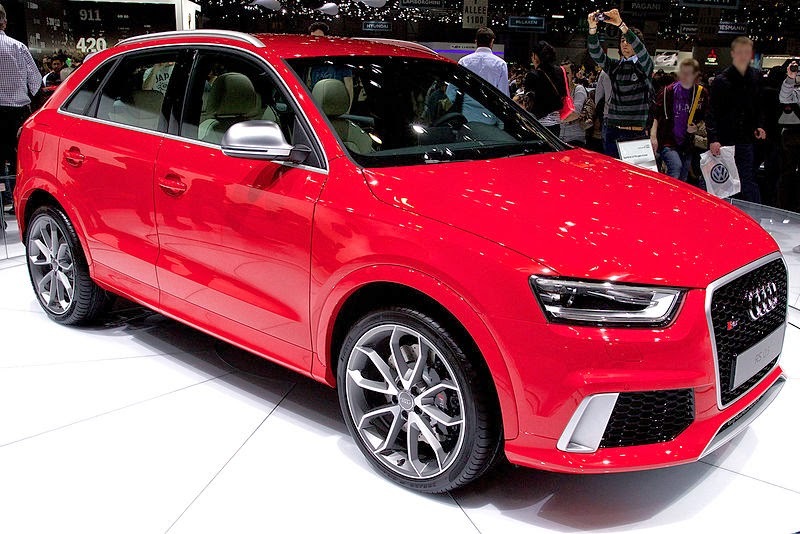 In 2014, the Q3 will make its debut in the North American market. 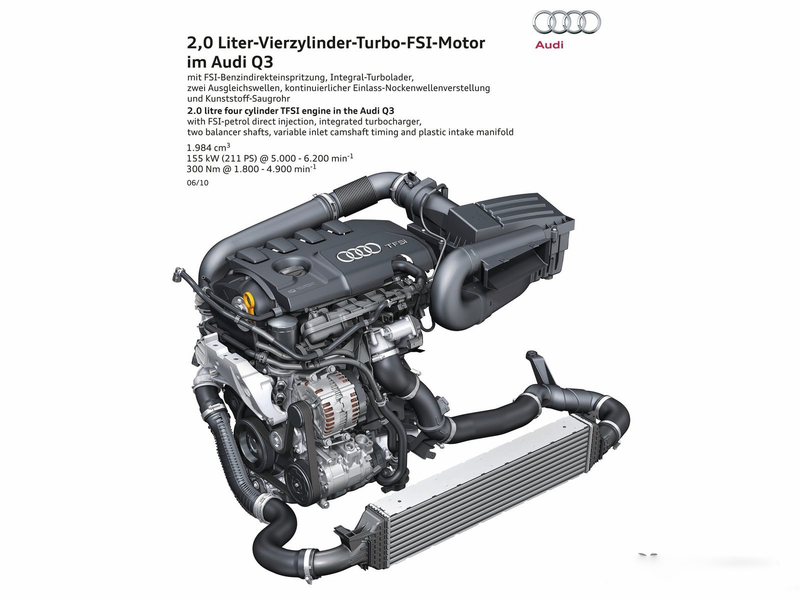 The high-performance RS Q3 will also be available. Last updated on 9 May 2014 at 16:24.